University of Texas System Chancellor Bill McRaven is resigning in May, he told regents Friday. Bill McRaven, the nationally famous and lately embattled chancellor of the University of Texas System, is stepping down in May. He announced the decision Friday afternoon during a meeting over the phone with the UT System’s Board of Regents. It comes after months of pressure from board members and state lawmakers. But McRaven cited health reasons for his pending departure. “There is going to be a lot of speculation as to why I am stepping down, but the fact is that this is a very personal decision for me," McRaven told the regents, according to a video of the meeting. "As many of you know, over the past several months, I have been dealing with some health issues. They are not serious — let me say that again, they are not serious — but they have caused me to rethink my future." McRaven, 62, came to the UT System from the Navy, where he commanded special forces and was the architect of the SEAL raid that killed Osama bin Laden. He has previously disclosed that he suffers from chronic lymphocytic leukemia but has stressed that it isn't life-threatening. At the system, he oversaw 14 universities and health institutions across the state. In a 2015 commencement address at the UT Southwestern Medical Center, he said a doctor gave his wife an optimistic prognosis in 2010 soon after he was diagnosed: "Something else will kill him long before this does." 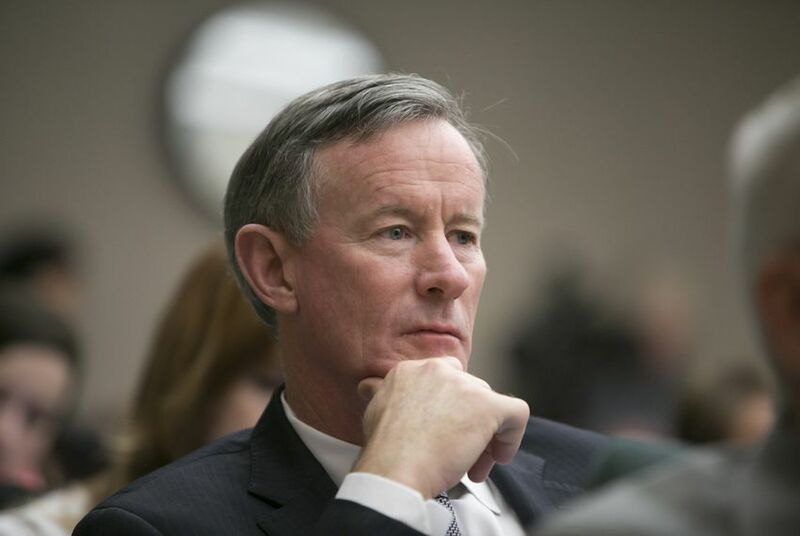 Lately, McRaven has faced questions over the scope and spending at the UT System. He enraged lawmakers in 2015 when he announced the $215 million purchase of land in the middle of Houston for a collaborative system campus. And he has clashed with the leadership of the flagship University of Texas at Austin over whether the system should spend $4.5 million on a bid to manage the Los Alamos National Laboratory. McRaven has championed the idea; UT-Austin leaders are opposed. Amid that strife, it had already become clear that McRaven’s contract wouldn’t be renewed when it was set to expire next month. Instead, he was expected to continue on at an at-will basis. Still, regents and UT leaders applauded his service after the resignation announcement Friday. “Your legacy for me, chancellor, will be to think big and bold as we define our strategy to advance each of our 14 institutions to their highest potential,” said board Chairman Sara Martinez Tucker. And Greg Fenves, UT-Austin's president, called McRaven "a great leader" and said, "I have been honored to work with him." When the UT System hired McRaven in 2014, it was considered a coup. Regents gave him a three-year contract worth $1.2 million per year, plus housing and performance incentives. And about a year into his term, he announced a grand vision for the system that included nine “Quantum Leaps” that he said would make UT the envy of university systems across the world. Soon, regents had allocated $60 million to help accomplish those goals. The Houston land purchase was the highest-profile idea — and it proved to be a boondoggle from the start. State lawmakers were furious that they weren’t told of the plan ahead of time. And University of Houston leaders fought the plan because they viewed it as an encroachment. The project was axed in early 2017. McRaven also felt heat from members of his own board, particularly regents appointed by Republican Gov. Greg Abbott after McRaven had already been hired. They questioned whether the UT System offices had grown too big and spent too much money. This year, regents have approved a policy change that sent a slightly larger share of the system’s revenue from a massive oil-funded endowment directly to UT-Austin, instead of allowing it to be spent at the system offices that McRaven oversees. And last month, the UT regents formed a task force to review more closely what the UT System office's mission should be. The task force will be chaired by Regent Kevin Eltife, a former state senator who has been one of the loudest voices questioning the growth of the system. That group is expected to report back in July or August — likely after McRaven has left. As the year wound down and it became clear that McRaven wouldn’t have his contract renewed, he and other system leaders insisted that it wasn’t a sign of his imminent departure. Officials noted that McRaven was the first UT System chancellor to get a contract and said leaders simply wanted to go back to the old way of doing things. It would have been unusual for McRaven to continue on for long without a contract, though. The chancellors of the Texas A&M, University of Houston, Texas Tech and University of North Texas systems are all currently under contract. McRaven didn’t say what his plans would be after he left the system, though he has long been rumored to be a potential candidate for elected office or to return to the federal government. On Friday, he expressed less professionally ambitious goals. “I want to teach," he said. "I want to write. I want to do some traveling. And as hackneyed as it sounds when someone is stepping down, I want to spend time with my family." But, he added, "I am not leaving for a while, and we still have a lot of work to do." Key among that work is trying to win that Los Alamos bid. "I remain completely and fully committed to securing the bid for the Los Alamos National Laboratory," McRaven said. "I think the initiative is one of the most important in the history of the UT System. We have put together a world-class team to run the lab." Disclosure: The University of Texas System, Texas A&M System, the University of Houston, Texas Tech University and the University of North Texas have been financial supporters of The Texas Tribune. A complete list of Tribune donors and sponsors is available here.